Over Golden Week I had a chance to take a trip deep into the mountains of northern Akita on a quest to find a rare, hand-forged hunting knife – the Matagi Nagasa. I recently learned of the Matagi culture of bear hunters in northern Japan and how they use a special hunting knife when they go off into the snowy mountains for several weeks at a time. One of my colleagues at work told me about them. He grew up in a mountains village so he knows about them first hand. 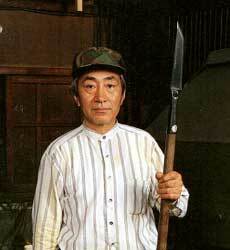 After a bit of research I discovered the name of the best blacksmith – Minoru Nishime, a fourth generation knife-maker – still making the knives by hand for the hunting community. It was a beautiful spring day, the sun was shining when I left my home in Yurihonjo, on the coast of southern Akita, and drove for three hours up into the mountains. There were still patches of snow next to the road as I crossed the high passes. I had a map from the Japanese website along with the photo of their shop and its sign, so I had no trouble locating the place once I reached Ani, one of the main the areas in northern Akita where the bear hunting culture still flourishes. The blacksmith shop is on the side of the road, just before it reaches the town of Ani-Arase. I breathed a sigh of relief when I saw that the shop was open. Since it was Golden Week it could have gone either way – closed so the family could travel or open because of the increase in customers. I had to call out “Sumimasen!” several times before anyone knew I was there. Finally the blacksmith’s wife came into the shop. Her husband was away, but she could show me the knives. I already had an idea about what I wanted; a mid-sized knife with an oak handle, so I compared the 210mm blade to the one with the 180mm blade. Both were the same price: ￥23,000 – about USD $190.00. I found that I preferred the size, weight and balance of the 180mm [7 inch] blade so I bought it on the spot. I took a number of photos of the interior of the shop, as it was easy to see that the knives were each meticulously hand-forge and custom-made. Ecstatic over the successful conclusion to my quest, I stopped at some shops specializing in local products and bought some handmade, thick soba noodles for my dinner, then slowly drove back home, savoring the pristine scenery, glancing again and a gain at my new prized possession on the seat besides me. Once I got the knife home I discovered that the only suitable place to display it was on a stand next to a military-grade, hand-forged Nepali Khukri, the knife of the Ghurka mercenaries, that I picked up in Kathmandu. Hey! Thanks for giving me your business card at PanSIG! What a great post! And what a cool knife! Hi there, this is a fantastic article. I’m really interested in this knife and shop. Do you have any additional information or know of any websites that carry the knives? I’m hoping to buy one from the USA without having to book a flight to Japan! Thanks for the article. I received one of these knives (fukuro nagasa) with Nishime’s name engraved on it as a gift from a friend. This is my first season hunting in Japan and I’m looking forward to using it as soon as I bag a deer, wild boar or bear. It’s a great knife. Have fun with it. Hope you have all the proper hunting licenses for Japan. I know that they are very strict. Lots of snow up here in Akita, and the bears will be sleeping now. Good thing, since I think they ate somewhere around six people this year. I’m impressed. The test is quite hard. A couple of friends, both quite fluent in Japanese, took the hunting license test earlier this year, but failed. One of them wanted to hunt the wild boars getting into his garden. I see you heard about the old farmers being eaten while picking wild mountain vegetables. I didn’t realize the news made it out of the local Akita area. They even spotted bears in our university’s parking lot this year, and we are on the coast. I studied quite hard for the gun license test. It was much more difficult than the hunting license test. Here in Gunma they hold a practice seminar for first time hunting license applicants before the test is given. If you attend the seminar the test isn’t that hard to pass. But the gun license test is very challenging with lots of trick questions and you have to score 90% or better to pass. The news of bear attacks was on NHK every day… lots of media attention nation wide. We had one bear in front of our home in August. I chased it down as it headed into an area with lots of hikers. Eventually I nailed it with bear spray and got it to leave our neighborhood.